For the fourth-consecutive year, the stars of Ring of Honor and New Japan Pro-Wrestling will do battle with and against one another on the War of the Worlds Tour! Titles will be contested and dream matches realized as all of your favorite stars from ROH and NJPW do battle in Toronto, Dearborn, New York City, and Philadelphia! With the relationship between ROH and NJPW stronger than ever, tickets have moved fast and these events will sell out. If you are considering coming, do not hesitate! Time is of the essence – get your tickets now! Officials from NJPW and ROH have been working around the clock to finalize matches for the War of the Worlds Pay Per View, emanating from the sold out Manhattan Center’s Hammerstein Ballroom! It will be broadcast LIVE on Pay Per View, the FiteTV App, Playstation Network, and ROHWrestling.com, Friday May 12 with a 9 PM EST bell time! The ROH World Championship will be defended LIVE on Pay Per View in a triple threat match! In front of the largest crowd in ROH history, “The American Nightmare” Cody made a statement only one hour after going through one of the most grueling matches of his career, a Texas Bullrope Match against Jay Lethal. Cody attacked a celebrating Christopher Daniels, leaving the ROH World Champion laying following a successful championship defense against Dalton Castle. One week later, Cody interrupted Daniels as Ring of Honor Wrestling took to the air, issuing a challenge for the War of the Worlds Pay Per View! Daniels was ready to fight in Baltimore but Cody arrogantly stated he was too good for Baltimore and that only a venue as prestigious as the Manhattan Center’s Hammerstein Ballroom and a setting as thrilling as Pay Per View was good enough for a title shot. But, there was a snag in Cody’s plan: in Las Vegas, there was an eight-man Vegas Wild Card tag team bout where the winning team would move on to face one another in a Four Corners Survival match on Ring of Honor Wrestling to earn a title shot. The ROH Board of Directors had decided the winner of that match, its participants being Hangman Page, Jay Lethal, Jay White, and Silas Young, would earn the coveted ROH World Title shot LIVE on Pay Per View in front of a worldwide audience. Lethal won the match, earning him an opportunity at ROH World Championship number two! After some deliberation, and the threat of legal action by Cody after what he claims was entering into a verbal contract with Daniels on ROH television, the main event of War of the Worlds – New York is now a Triple Threat Match for the ROH World Championship! And Cody, a man who knows his spot is guaranteed, has manipulated his way into a major advantage in the building where he shocked the world in his ROH debut by delivering a low blow and defeating the Franchise of ROH, Jay Lethal! “The American Nightmare” and Lethal know for certain that they will be competing in the main event of the War of the Worlds Pay Per View. Their issue boiled over at Supercard of Honor but it stands to reason that, with the series tied at one and one, nothing has been permanently settled! Daniels emerged victorious over Matt Taven at War of the Worlds – Dearborn but the wrestling world is wondering what the veteran competitor has left in the tank. Does he have enough to fend off Cody and Lethal? Will Lethal capture his second ROH World Championship in the city where he won his first? 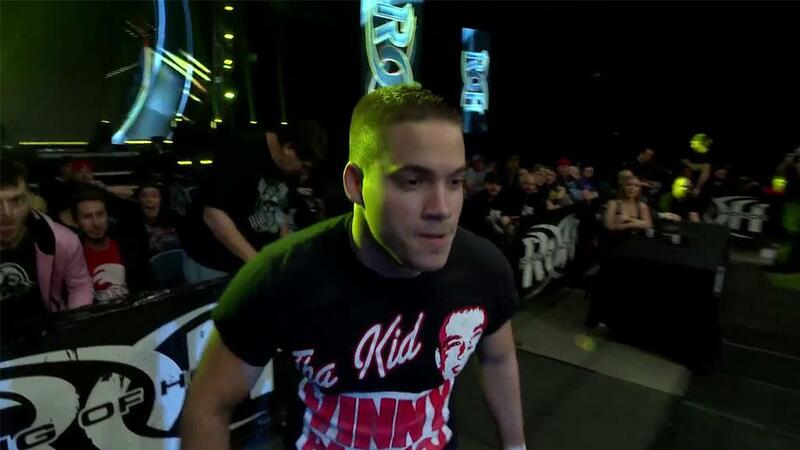 Or will Cody duplicate the outcome of his ROH debut in the Hammerstein and leave as ROH Champion? You have to order War of the Worlds to find out! In front of a sold-out crowd in New York City, the ROH World Championship is on the line! If you didn’t get tickets, the only way to watch this is LIVE on Pay Per View, Fite TV app, Playstation Network, or ROHWrestling.com! Eck's Files: Briscoes To Face G.O.D. In Chicago; LifeBlood Recruiting Flip? How Worried Should Taven Be About PCO?